We continue to remain invested in high quality small and mid cap companies with strong fundamentals and increase allocation in these companies during ongoing market correction. We strongly believe that any significant fall in market from current level must be considered as a buying opportunity. We expect cyclical stocks with strong fundamentals will continue to outperform going forward considering ease in interest rates, stable crude oil prices and higher spending. If we look at 2015 and 2016, we find stock market extremely volatile as major indices - Sensex and Nifty made all time high in March last year, later corrected by almost 25% over period of next 12 months followed by sharp recovery of more than 26% during last 8 months from recent lows of Feb'16 and is now again going through correction with continuous selling by FIIs. Sharp fall in stock prices in the month of Jan and Feb 2016 created panic situation for many new investors without any cues and put them on back foot when it comes to investing in equities. In the month of Feb'16, many investors were expecting further fall in stock market with indices testing new lows and hence remained on sidelines. However post union budget, we have witnessed strong rally across all broader indices as FII turned to be net buyers in the month of March and later in following months this year considering positive developments like Union budget with focus on fiscal discipline, change in Fed views regarding US rate hike, stability in commodity prices and normal monsoon and passage of GST bill which helped major indices, Sensex and Nifty to rise by more than 26% from their recent lows made in last week of Feb this year. However, FIIs turned net sellers in the month of October and November. FIIs have sold off equities equities over 11,500 crores in October and November so far and we believe FIIs selling Indian equities will continue in coming weeks, we do not expect any steep fall in stock market as it will be supported by domestic Institution and fund houses turning them to net buyers. The recent fall in market was due to prevailing global uncertainity which got intensified during the week with Donald Trump winning the presidential election in US and Indian Prime Minister Narendra Modi declaring ban on Rs. 500 and Rs. 1000 Indian currency notes to fight against black money, fake currency and terrorism in India. Demonetization of Rs. 500 and Rs. 1000 currency notes is one of the biggest reform by Modi Government and will be helpful for Indian economy in long term, however in near term it will squeeze liquidity and have a negative impact on overall cash transactions happening in the country. We believe further correction of 3% to 5% in major indices from current levels can't be ruled out going forward. However as stated in many of our posts earlier, we do not believe in timing the market and always suggest our members to avoid it and invest in equities in a systematic way keeping a long term horizon. Moreover, these type of corrections give great entry point to long term investors as they get an opportunity to add high quality companies with strong fundamentals at discounted price. Since inception, our Wealth-Builder portfolio has outperformed Nifty and Sensex by wide margin. Since 1st Jan 2013, Nifty has given returns of 39.4%, Sensex returns is 37% where as our Wealth-Builder portfolio has given returns of 271.2% to our members. 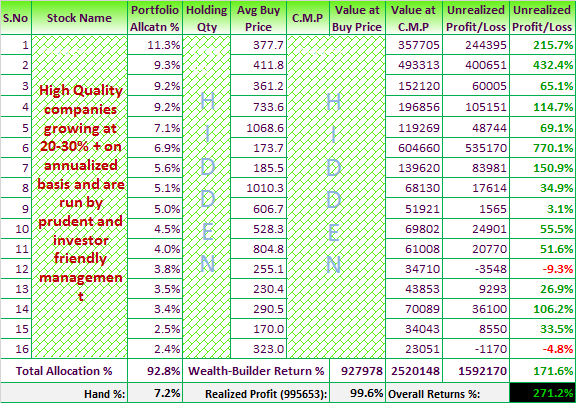 In terms of performance, 10 top performer stocks out of 16 of Wealth-Builder portfolio have given returns in the range of 50% to 770% since 1st Jan'13 that too when couple of stocks out of 16 were added in portfolio during last year and this year. Moreover, 10 stocks out of 16 have made 52 week high / all time high recently. We continue to hold these stocks as we believe these companies are registering good growth every quarter and doing all the right things to continue delivering robust top line and bottom line with strong operating margins. Note: Wealth-Builder portfolio update - Nov'16 will be released on 13th Nov'16 and we will share the same with our Wealth-Builder members. Start managing your equity portfolio like a professional, subscribe to Wealth-Builder by paying nominal annual fee of Rs.15,000 for entire year.